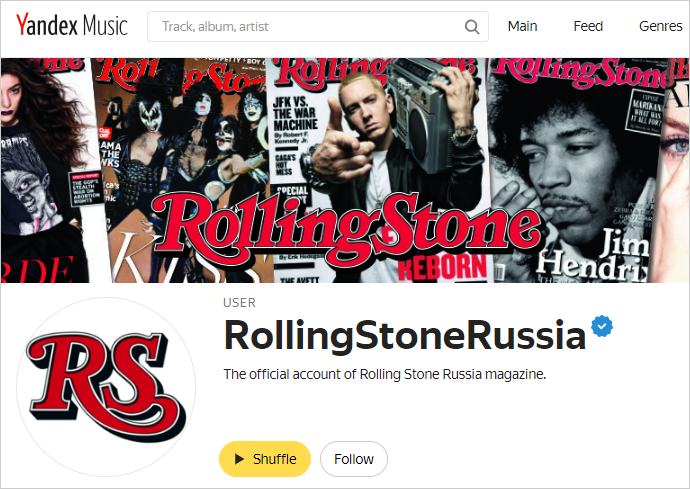 The media, communities, labels, musicians, or other public figures may create verified accounts on Yandex Music. These types of accounts serve as the official representation of that person, brand, or company. If you have a Yandex account, go to the next step. If you don't have an account with us, register for a new one. For more information, read the Account registration section of the Yandex.Passport Help. In the account settings, enter your Yandex username. It should match the name of your organization, band, or artist. In the Profile portrait section, upload your avatar. Tell us that you want to verify the account. Attach your cover image and account description to the email. In the description, you can post a link to the official site of your organization and other useful information. Wait for account confirmation (this usually takes a few days). After your account is confirmed, you will see the icon on your page.